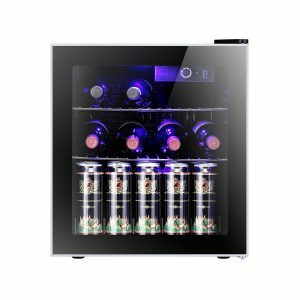 Antarctic Star Wine and Beer Cooler is offered in two different sizes: 17 bottles (SINAS46) and 37 bottles (INAS128) for both home and office use. Both are freestanding / standalone design wine coolers with advanced cooling systems thanks to the efficient compressors and include CFC-free polyurethane foam insulation. They are rated 4.7 out of 5 stars by 5 customers that purchased and used them, as they are decent quality and functional wine coolers. You can keep your red and wine bottles at the optimal temperature and humidity conditions. 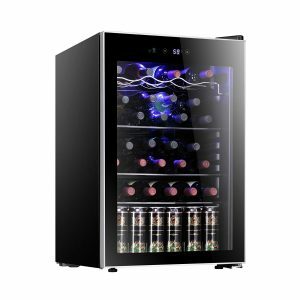 The larger 37-bottle capacity wine cellar comes with an LED-backlit panel with three touch buttons for temperature up and down and light. The smaller 17-bottle wine cooler has the temperature dial and a switch for light on and off. They both run quietly and without vibrations that could potentially harm the naturally occurring sediments in wine. You will not hear much even when they’re doing the cycles. As you would be aware heat is not good for wine and these wine coolers will offer the optimal wine storage environment for their long-term aging. You can adjust the temperature between 40 and 61 degrees Fahrenheit. The powerful and efficient compressors will ensure they stay at the temps you set them. And 55 degrees is often considered as ideal for both red and white bottles. They have the double pane reinforced glass doors with proper air-tight sealing. And the glass filters the ultraviolet lights that can be bad for your wines- age them prematurely and degrade the taste and texture. You’ll find the soft blue LED lights inside that will help show off your wines nicely without generating any heat. You can also keep your beer and soda cans or bottles in both units. You can place your bottles horizontally on their movable black shelves as you see in the photos. Please note that there is no lock on either of the units. These are not designed as built-in wine coolers and should only be used as freestanding units. Having said that you can put them under the counter as long as you have enough space on the sides and at the back. They have the adjustable leveling legs underneath to keep them even. The door will close better when you have the two front leveling legs extended a little. The 37-bottle cooler weighs 73.6 pounds and measures 20.5 x 21.3 x 31.4 inches. And the smaller 17-bottle cooler weighs 36.5 pounds, with the measurements of 17.5 x 18.6 x 19.6 inches. They look nice- the classic design with the stainless steel around it is easy on the eyes. The former comes with a glass shelf and three chrome shelves and the latter with two chrome shelves for your wine and beer bottles and cans. With the built-in radiant cooling on the walls you’ll have even cooling all over consistently. Overall you2re getting good value for the dollar.